We met Kirsten McCormick last year and loved learning among her many talents about her successful partnership with essential oils and Young Living. Kirsten has been using essential oils to keep her family healthy, but it didn’t come without lots of research and digging. We asked her to give us some tips about shopping for essential oils and here is what she had to say. Going non-toxic is a slippery slope. At first you just want to make sure your lotion isn’t going to make you break out and soon you are tossing out anything with “fragrance” in the ingredients list. Cause you are into reading ingredients lists. Nerd. I had never given essential oils a second thought, other than that maybe they were a natural way to make things smell nice. 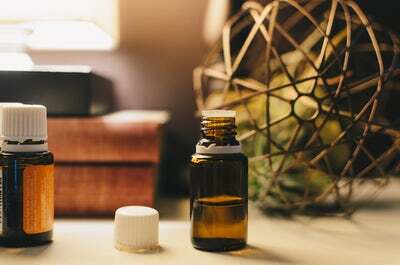 I had no idea that pure essential oils are one of the few substances that can cross the blood brain barrier, increasing the absorption rate of any supplements they are combined with. Or that their electromagnetic frequency can be measured and is higher than fresh fruits and vegetable, herbs and most other living, nourishing substances. I also had no idea people were using them to support everything from their immune systems to their hormones. In a BIG way. I played around with essential oils a little bit, but got inconsistent results. I didn’t know that this was because most of the oils I tried were more of a “perfume grade”... meaning they might have about 5% pure oil, but the other 95% was either floral water, carrier oil or synthetic. I assumed that if it said, “100% pure” on the bottle then it was 100% pure. I had no idea that adulteration is a rampant problem and that there is no governing agency testing these oils for purity. So, when I got serious about using oils for my health, I had some major questions to ask and I did a LOT of digging. These are questions I encourage everyone to ask of whatever company they choose to get their oils from. Where are the plants grown? Good companies either grow their own plants or can point you to the farms they source from. If they don’t know, then it means they obtain their oils through brokers and cannot trace back to the source if there is a quality issue. Do they harvest at peak time? It takes a trained farmer to know exactly when the ideal time to harvest the plants and distill them is, in order to get the best quality oil. How is distillation done? You want to find a company that distills in stainless steel at low pressure and low temperature. Yes, you can get a higher yield (and therefore more profit) by using high pressure and high temps, but you sacrifice a lot of the health benefits because you destroy many of the delicate compounds in the oils. You also want to make sure they use coned lids. Plus, if they aren’t using stainless steel (or they don’t know what containers they are using), the oils likely have traces of heavy metals in them. EW! Do they use anti-rust chemicals in the boilers? These chemicals prolong the life of the boilers, but they also get in your oils. A good company will be willing to replace their boilers as often as needed to avoid using nasty anti-rust chemicals. Do they test every batch? Do they send it out for 3rd party testing? Do they ever use solvents? Do they discard their mistakes? It took me a while to find a company that could satisfy all of my questions and that would even let me visit their farms first hand. Since then I have spent a lot of time on the farms, volunteering, watching, learning and asking questions. Totally worth the research, because I can completely trust my essential oils to keep us healthy… While I am super grateful for modern medicine, I haven’t had to go (or take any of my kids) to the doctor in the last 4 and a half years. Our natural health arsenal keeps us vibrantly healthy. So, once you have found a company that can satisfactorily answer the above questions, here are the top 3 oils that you are going to want to get ASAP. Interestingly, this is the MOST commonly adulterated oil in the US. It’s a very popular scent and there are not enough lavender farms in the world to supply the demand for lotions, body sprays and candles. So if you smell lavender scented items and immediately get a headache, you are in good company. The good news, is that pure lavender is a completely different substance and does the body good. Lavender is very multi-purpose and can be used for relaxation, stress and sleep as well as for skincare… nothing beats it after being out in the sun. I also have been known to put a little dab up my nose when the seasons change. This oil will do your head good, help with digestion if you eat or drink something that is being unkind to your belly and it can perk me up like nothing else. I also enjoy feeling the opening rush of air into my sinuses when I inhale it! This is actually a blend, but nothing beats it for THAT time of the month. It helps with both the physical discomforts and the emotional CRAZY my “dragon” time can put my family through. I rub it over my ovaries and diffuse it the whole week. It makes me bearable and comfortable when I wouldn’t be otherwise. I’d love to hear what essential oils you use and love. Come connect with my on instagram! You can find me @cheerfullyimperfect. You can learn more or order oils from Kirsten at Cheerfully Imperfect.